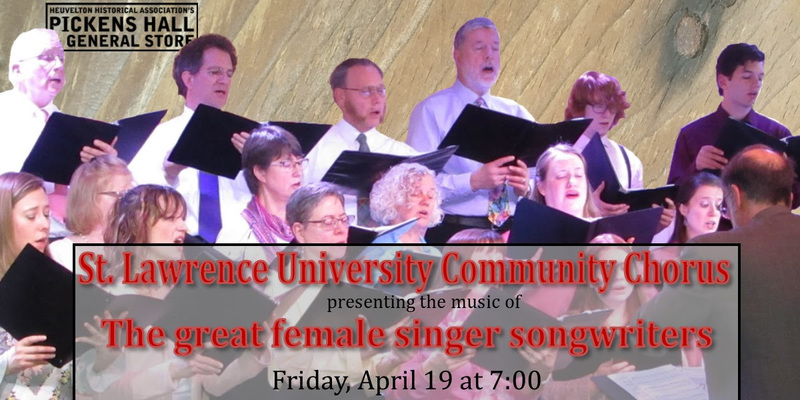 St. Lawrence University Chorus brings together the vocal talents of students, faculty and staff, and community members from Canton and surrounding regions. Under the guidance of conductor Barry Torres, they have prepared a tribute to the great female singer-songwriters of North America. Come hear a new take on some the classics, performed by your neighbors and community members! Admission is by donation. This concert is to benefit the Heuvelton Historical Assocation, so please give what you can. Refreshments provided. Our hall is handicapped accessible.